The Princeton Patriots took the loss in this late-August 1990 game and The Bluefield Daily Telegraph announced the next day's starter. That starter against rival Kingsport, The Daily Telegraph wrote, was lefthander Chris Snyder. That start for Snyder came near the end of his first season as a pro. It also marked one of his final as a pro. Snyder started 13 games for rookie Princeton that year, marking the extent of his career. Snyder's pro career began and ended that year in 1990, signed as an undrafted free agent out of the University of Tennessee. The Tennessee media book identifies the team that signed him as the Braves. With the Volunteers, Snyder gave up two runs in relief in a March 1989 game against North Carolina. 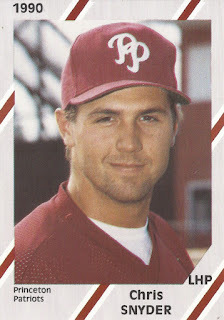 Overall, he went 3-6 in 1989, with a 5.17 ERA and 4-3, with a 5.95 ERA in 1990. Assigned to co-op rookie Princeton in the Appalachian League, Snyder got into 14 games, starting 13. He went 5-5, with a 2.48 ERA. He also threw one shutout and four complete games. Snyder, though, played just that one season. He didn't get into another.